Psychological well-being can be influenced by several factors. 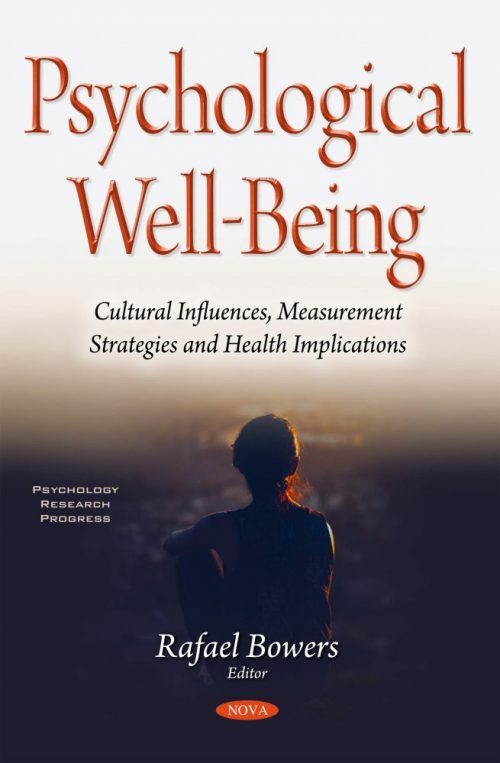 This book provides research and reviews cultural influences of well-being, as well as discusses measurement strategies and health implications. Chapter One studies immigrants’ psychological well-being by investigating their motivation, preference of tourist activities, and emotional experiences during their visit to their homeland. Chapter Two proposes the creation and validation of theories and measures on positive psychological constructs that can be integrated into a tool that aims at what might be called a desirable and credible global psychology. Chapter Three examines the relationship between language, identity and behavioral acculturation and well-being among non-western skilled migrants in a western host society. Chapter Four discusses well-being, health status and culture. Chapter Five analyzes emotional intelligence in adolescents. Chapter Six provides a study of the psychological well-being of Chinese immigrant adolescents. Chapter Seven explains variables related to psychological well-being, and discuss the importance of psychological well-being in the field of psychological counseling and guidance. Chapter Eight examines the predictive role of marital relations and communication styles in psychological well-being within a model proposed by Ryff. The final chapter studies the psychological health among frail older adults with chronic pain. Psychological Health among Frail Older Adults with Chronic Pain in the Community: Does the Healthy Living Program Help?